I’ve been mostly been staying with the Ralphs (that is their surname, I don’t mean there’s a house full of people called Ralph) who have been wonderful hosts and made me feel very at home. Between them they’ve been to quite a few of my shows while I’ve been here too! Next on that list of shows was Wanneroo Folk Club which was a really great night. Superb support was provided by the exquisite harmony vocals of Gypsy Lou and I really enjoyed my set. The audience were wonderful and bought plenty of CDs which of course always helps. The following day I ran a banjo workshop at the wonderful Zenith Music, a terrific music shop in Perth and one attendee was Ian Simpson, arguably Australia’s finest banjo player. No pressure then! He was a lovely chap too and we had a cracking little jam afterwards which you can find online I believe. Next up it was to Bindoon, a very small town and I played at its hall. This was a really lovely gig with another brilliant crowd and a great setting. 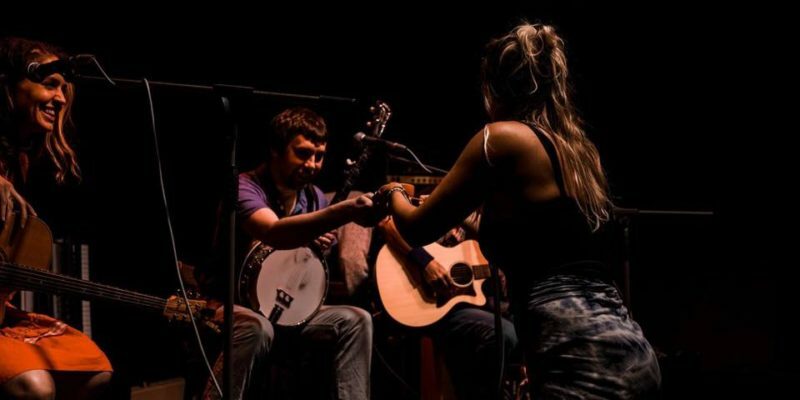 These small town gigs can be really special as it brings out a community and they all seemed very happy I had visited their little town on my tour. Special thanks to Barni for organising and hosting me. Then it was off to the Ravenswood Hotel in…Ravenswood. The gig was strangely crap if I’m totally honest but I actually had a wail of a time at the open mic later that night where I ended up playing a set and getting considerably more reaction than I had done at the gig! All in all a good experience and a lovely area too. 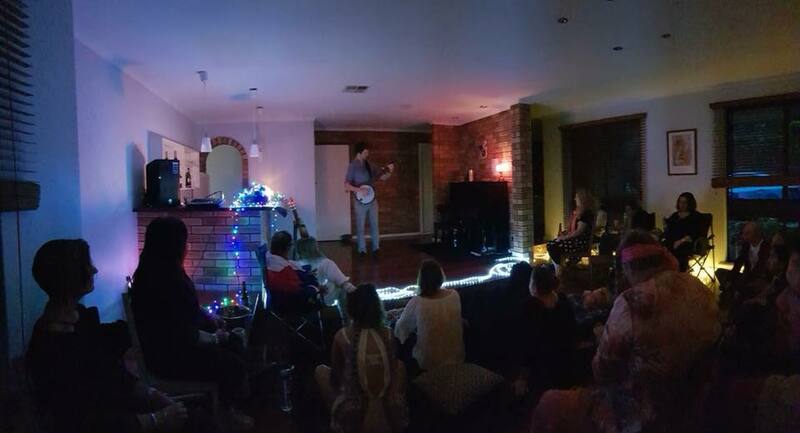 Then came Casuarina where I played an absolutely wonderful house concert organised by the marvellous Jenny. A really lovely crowd in a beautiful setting and lots of nice chat over a glass or two of wine afterwards. You can see from the photo, it was a lovely intimate gig. Then came my first day off which was spent on the beach…an excellent way to spend time and I just couldn’t tear myself away from the lovely sea for a very long time. But it came at a price…daft thicko British tourist of course forgets to put on suncream prior to spending hour after hour in the blazing Australian sun. I realised as I was walking to the car and even now I type this as I wince at the excruciating pain in my back. Yes it was all my fault I know but having the banjo on my back last night was less than pleasant…plus for a day afterwards the traffic was waiting for me to change to green.